Summers Place Auctions' 10th Anniversary Auction on the 12th & 13th June 2018 will also include a category which is relatively new to the auction house – Tribal Art. Introduced last June to such success that all sales since have included tribal lots, this June will see some of the best Tribal Art to come up for auction in the UK for a long time. 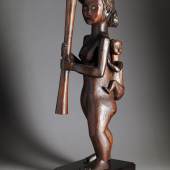 Highlights include a Mother and Child Sculpture from the Mabea tribe (from Cameroon) and it comes with great provenance and was certified by P. Ratton in 1995. 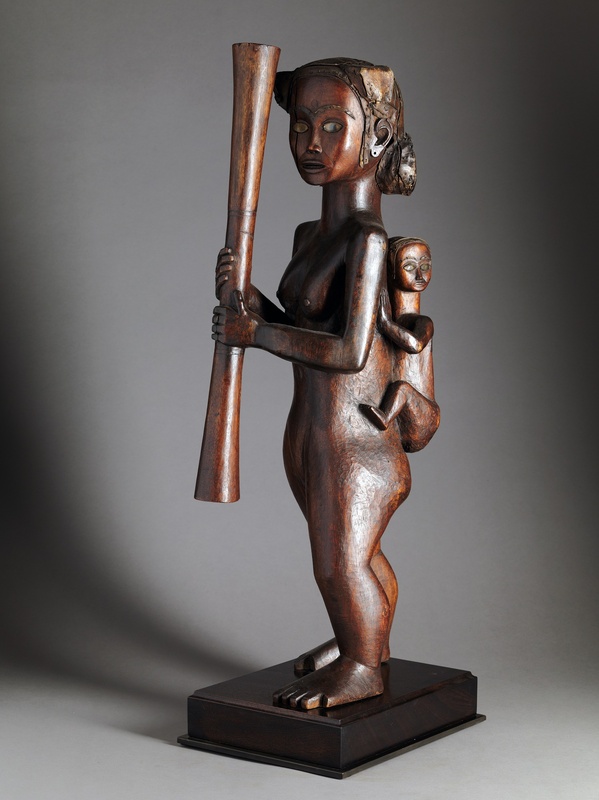 This standing Fang Mabea Maternity sculpture is undoubtedly of Museum quality. The mother is carrying a child on her back and her left leg indicates a walking movement, which is not frequently seen in African sculptures. 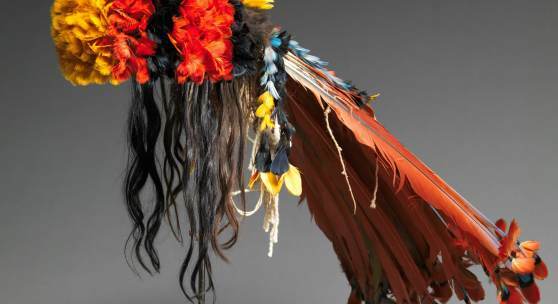 The eyes are inlaid with glass, the mouth has fine metal teeth and her hair dress, in leather, is fixed with indigenous little nails. The statue has a brown patina typical for the region and dates from the beginning of the 20th century, when it was supposedly made for a Colonial Exhibition in France. It was originally owned by R. Caillois (1913-1978), writer, sociologist and member of the “Académie Française”. He was in contact with Andre Breton in the 1930s and befriended Salvador Dali, Paul Eluard and Max Ernst. Once he broke with the Surrealist movement in 1935, he started the magazine 'Inquisitions' with Tzara and Aragon. 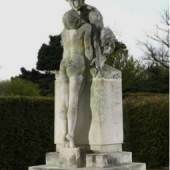 After his death the sculpture stayed in the family before it sold to Baroness Josephine Sloet tot Everlo, who owned the sculpture until the end of 2014. 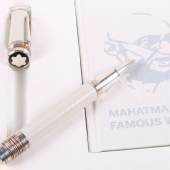 It is estimated at £49,500 – 66,000. 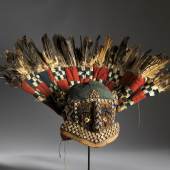 Rulers throughout the many Kingdoms in the Cameroon Grassland region (Bamileke –Bamum -Tikar) employed a range of Regalia to assert their political, economic and religious power. Presented publicly in lavish displays of wealth and power, many court objects were distinguished by their elaborate bead embroidery. Imported from Venice, Bohemia or Amsterdam, glass beads were considered a luxury material whose use and distribution were controlled by the King. The decoration of objects with vast quantities of brilliantly coloured beads transformed utilitarian objects into symbols of royal status and prestige. 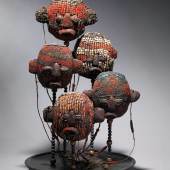 Other lots from Cameroon include a beaded Ceremonial Head "Atwonzen" from the Grassland people. 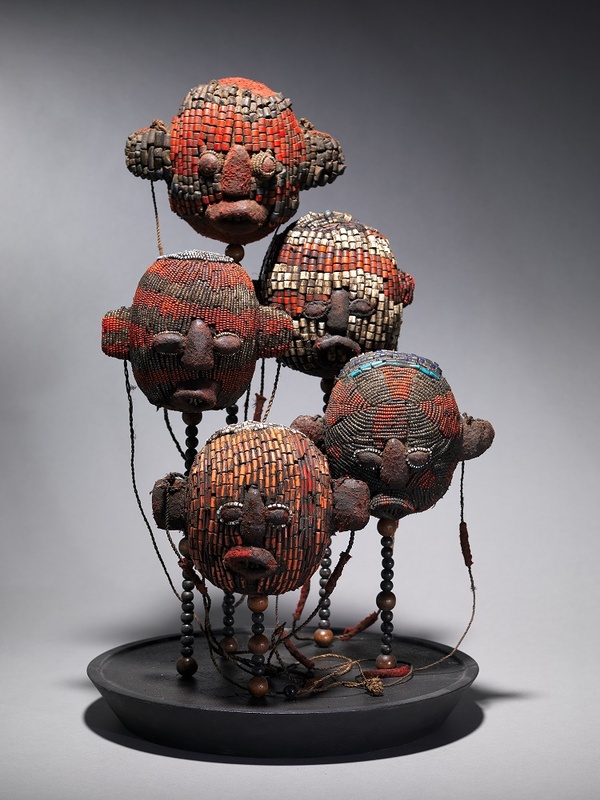 Beaded heads such as this represent trophy heads: the skulls of enemies felled in battle. Underneath the beading is not bone, however, but wood. 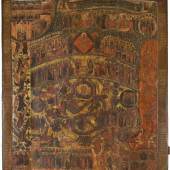 Relatively rare, works of this kind were associated with powerful otherworldly forces. Atwonzen were found only in the households of the Fon, or King, and their closest allies. 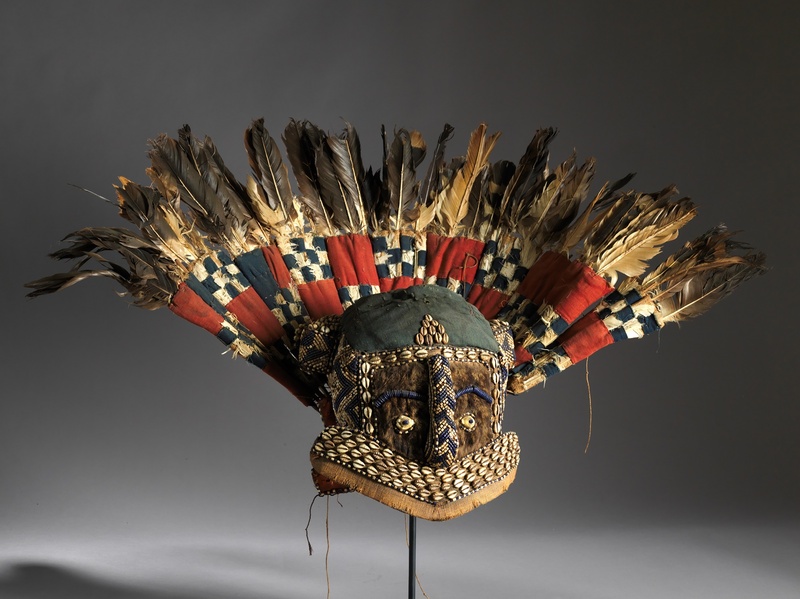 This is from the 1920s and estimated at £18,000 – 24,000, while a mouthblown Glass Dome with five fine Beaded Ceremonial Heads from the 1930s is expected to fetch £10,000 – 13,000. Also inspired by the very old and rare Atwonzen beaded skulls. They originate from the kingdoms located in the Dschang region. Highly symbolic, these depictions of enemies’ heads, wooden or the real skulls themselves, were carried by rulers on ceremonial occasions and during certain warrior dances such as the tso or nzen. They were often covered with the same type of beads and designs; whereas the Royal Atwonzens had unique embroideries. One is represented in the Caroline and Marshall Mount collection. The double headed snake is the symbol of the Bamum Kingdom. Initially the King was the only person to wear the belt made of a raffia woven strip covered with cloth and beads. 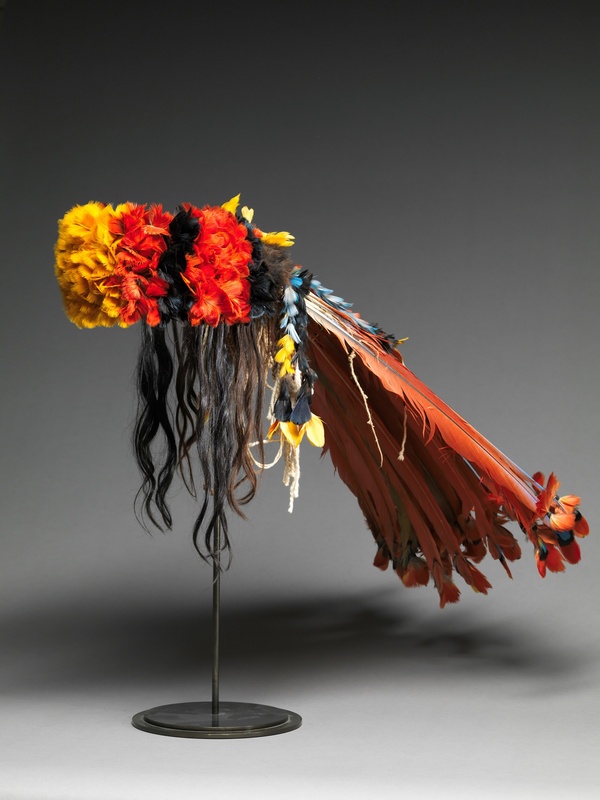 After the arrival of the Germans, important lineage representatives were also allowed to use these Regalia. 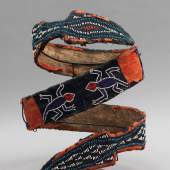 Covered with typical animal symbols, the belt from the 1930s is estimated to sell for £5,000 – 7,000. 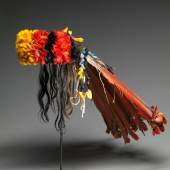 Also from the same era, a beaded Royal Headdress by the Bamileke people, made of a palm tree fiber structure with a Leopard figure on top of the headdress, is estimated at £16,500 – 22,000 – another examples can be found in the Field Museum of Chicago. 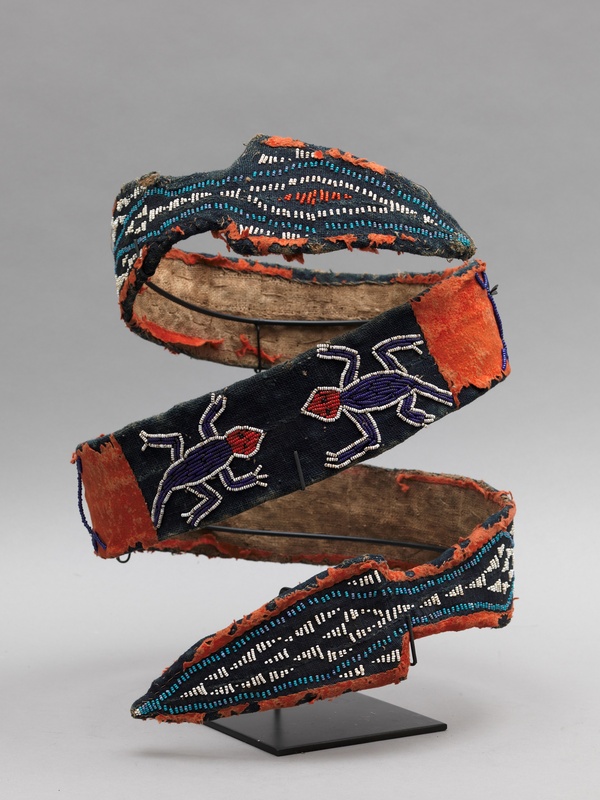 A Runner mask "Mabu", from the Wum people, is from the 1930s and estimated at £6,000 – 8,000. The secret association (Kwifon) in each kingdom has a runner mask that serves as the voice of Kwifon announcing their approach. Members on their missions are preceded by this mask and in some Western Grassfield kingdoms of the past, Mabu was also the mask of executioners. Wonderful exaggerated facial features with a nice dark finish, prominent shield-like projecting headdress, round cheeks and open mouth, the "Mabu" also performed at funerals and commemorative celebrations for important men of the village. Moving South on the African Continent, the Salampasu people live east of the Kasai River, on the frontier between the Democratic Republic of the Congo and Angola. A people with a reputation as fearless warriors, the Salampasu have retained the custom of a rough and primitive life. Salampasu masks were integral part of the warriors’ society whose primary task was to protect this small enclave against invasions by outside kingdoms. Wooden masks covered or not covered with copper sheets are worn by members of the ibuku warrior association who have killed in battle. A female fetish 'Kusu' figure from the 1920s with wooden pegs on head and a typical raffia skirt is estimated at £2,250 -3,000, while a Mother and Child Figure "Phemba", also from the Congo from the beginning of the 20th century, sitting on a little stool with a knitted headdress, suggest she was a Chief’s wife. 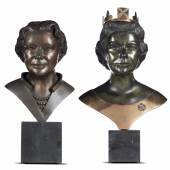 The open mouth shows her filed pointed teeth and the object shows signs of age and has a wonderful Patina – it is expected to sell for £14,250 –19,000.